Released worldwide in early 2018 following the announcement of a new global licensing deal between Gulf Oil and TAG Heuer, this addition to the popular line of Gulf-branded Monacos is arguably TAG’s most ambitious effort to date. Adorning the fabulously iconic light blue and orange Gulf colour scheme, this edition pays tribute to the historic yet informal relationship between both brands, encapsulated through the famous image of Steve McQueen fastening his Gulf-sponsored racing overalls during his role in the 1971 film Le Mans. Appropriately McQueen was wearing his famous Heuer Monaco 1133B, an image which epitomises Heuer’s rich history. This watch measures at 39mm in diameter and held within a steel alternate finishing case. The sapphire display case back presents a TAG Heuer Calibre 11 automatic movement. 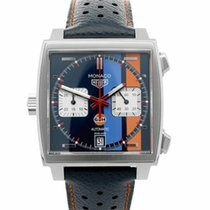 Importantly this newest incarnation of the Gulf Monaco is the first in the series to use the Heuer logo. This feature, coupled with the fact that this is the first Calibre 11 Monaco to incorporate a metallic blue dial, makes this piece a truly thrilling collector’s item. The added finesse of the blue calf skin strap with orange lining only amplifies this watch’s presence on the wrist. Alongside this particular unworn model comes its original packaging (both inner and outer) and guarantee. A fitting tribute to the racing heritage so tightly intertwined in Heuer’s DNA, this Gulf edition Monaco is a fabulous piece which celebrates the brand’s golden age.